Most of the challenges faced by the Palestinian higher education institutions (HEIs) towards internationalization stem from the problematic nature of bilateral relations of the Palestinian Authority (PA) in West Bank and Gaza Strip (WBGS) with Israel. Evaluating the geo-political, socio-economic, historical, and organizational barriers to internationalization of higher education in the WBGS, the chapter elaborates on the cumulative effects of the Israeli direct and indirect control over the WBGS on the development of universities, the impact of geo-political restraints of being a conflict zone, and logistical restrictions imposed on the movement of academics, visitors, and academic materials. Various domestic challenges including the political and ideological differences within the PA, the quality of national-level governance, and planning in higher education and financing are also highlighted throughout. Referring to the catalysts and obstacles, the chapter concludes with a reflection on the future challenges and prospects facing the Palestinian HEIs in a dynamic yet challenging context. Internationalization of higher education has been one of the primary concerns of the Palestinian National Authority for its development in the field of education. The Palestinian higher education community has not considered internationalization simply as a process of adopting the international means for development. Internationalization has rather been perceived as a driving force for economic, political and societal recognition by the international society as well as by Israel. Indeed, from the very early phases of their establishment, activities of the Palestinian higher education institutions toward internationalization have been mediated by the perplexing context of Israeli control over the education system, Palestinian struggle for national independence, socio-political turmoil and economic development (Zelkovitz, 2014). In this respect, Palestinian universities have been the dynamic forces of human empowerment (Bruhn, 2006) and national development under the most troubled social, political, and economic circumstances (Abu Lughod, 2000) especially until the end of the Israeli control over Palestinian territories in West Bank and Gaza Strip (WBGS) in the early 1990s. With the end of the Israeli rule over the WBGS territories and the establishment of the Palestinian National Authority in 1994, the higher education was restructured and initial efforts toward internationalization begun under the auspices of the Ministry of Education and Higher Education. These efforts gained momentum with further developments generated by the emerging necessity of adapting to the new processes of globalization and internationalization in the higher education field globally from the late 1990s onwards. The bourgeoning literature on the Palestinian higher education and its various aspects including the organizational effectiveness of Palestinian higher education institutions and programs (Abushawish et al., 2013), challenges (Gerner & Schrodt, 1999) and prospects of research and development in the Palestinian higher education (Qumsiyeh & Isaac, 2012) strategic impact and the socio-economic outcomes of higher education (Alfoqahaa, 2015), compatibility of Palestinian higher education with the local labour market (Abu Hilal, 1998) and the readiness of Palestinian higher education for e-learning (Shraim, 2012) have all been invaluable in shedding much-needed light onto the current situation with regards to the internationalization of the Palestinian higher education. These works have also underlined, in one way or another, the fact that Palestinian Higher education continues to be widely framed by the efforts towards global recognition and overcoming the obstacles emanating from the intra-regional tensions. In a fluid context marked by conflict and instability, there is nonetheless a persistent need to place the abovementioned debates and discussions about the existing structure of the Palestinian higher education system into a socio-political context in order to adequately account for the changes and continuities in the structural factors that mediate the efforts in relation to internationalization in the field of higher education. 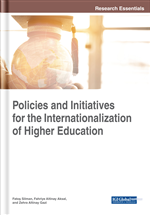 This chapter focuses on the dynamics and processes of internationalization of the Palestinian higher education by with particular reference to both catalysts of and challenges to internationalization. Reflecting on the catalysts for internationalization, the chapter examines the extent to which the key benchmarks in internationalization have been met. To this end, participation of the Palestinian higher education institutions in the internationally coordinated/funded programs such as Tempus and Erasmus through collaborative projects (Hammond, 2012) internationalized curricula, quality assurance (Dagga & Alyan, 2014); recruitment policies of international academic staff and students (Robinson, 2010) are evaluated with specific attention to the attainment of desired internationalisation outcomes.